When we last encountered our protagonists Franklin and Luna (Franklin’s Flying Bookshop, 2017) they were newfound friends: a dragon and a young lady sharing a love of books with anyone who had the courage to approach the library on Franklin’s scaly green back. In this new episode, Franklin and Luna Go to the Moon, the two team up again in search of Franklin’s biological family. Campbell and Harnett re-introduce Luna as a bright, excited, voracious reader. Franklin is her best friend, playmate, and above all else, fellow adventure traveler through both literary and real-life escapades. Together they learn about the lives and happenings of all kinds of creatures: mermaids, ghosts, werewolves, etc. But when it comes to dragons, well, there is a bit of a mystery. With little information about Franklin’s genealogy available either in a book or in his memory, Luna proposes a new mission, “to search for Franklin’s family and explore the world together!” Off they go wandering, encountering yetis, vampires, giants, elves, and all sorts of other non-dragon tribes, until they run out of ideas and energy. It is Luna’s pet tortoise (named Neil Armstrong) who peers through a telescope into the night sky and triggers a new brainstorm for Luna. Luna hops onto Franklin’s back and they make a beeline toward the moon. On the way Franklin’s memory is jogged and certain constellations start to look familiar. They make a landing in the midst of a looming lunar landscape and are lured in a particular direction by the sound of songs. Lo and behold, there frolics a pod of silver dragons, skating, playing and dancing. The presence of Luna disturbs the dragons, but Franklin chimes in to calm them down and the long-awaited family reunion commences. Mission accomplished. Readers familiar with Harnett will find the same, consistent style of illustrations. Muted jewel tones dominate the pages, rough line marks and patterns give a collage-like feel, and action is simple and effective. Page designs vary from full page illustrations to small plot-propelling vignettes. There is even a vertical spread to create the illusion of a vast universe of space. Story-wise, this project is equally as quirky as the last. Again, random choices lend to an awkward reading. The strangest being the use of the pet tortoise looking through a telescope. These two devices, the tortoise and the telescope, seem to crop up out of the blue. While Neil Armstrong the Tortoise is present in many of the illustrated settings with Luna and Franklin, there is no indication that he is an active character or participant in anything Franklin and Luna do and his action at this point in the story feels off. Likewise, having the tortoise be the pivot point of the plot, the critical shift of thought, deflects the solution away from Luna, who is portrayed as not clever enough to think of this herself until her pet did something. A slightly disempowering passive attribute for such an adventurous spirit. Also, the happy-go-lucky vibe of the book limits the amount of conflict that Luna seems capable of handling. The story makes light of real potential interrelational issues with flippant dialogue that gives the impression that this was made up on the spot during a bedtime tuck in. In the end, Luna gets along smashingly with Franklin’s family and they always have the telescope to look through to remind them of their connections to the moon. 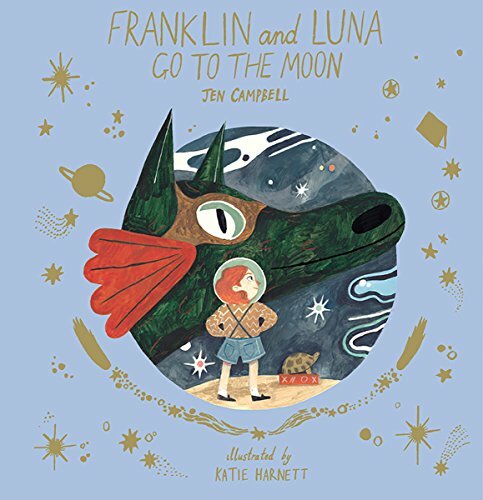 Franklin and Luna Go to the Moon demonstrates the satisfaction of finding out where your roots are, even if they are far, far away.